The Library of Congress Reading Room has been described as the most beautiful room in Washington, DC (The Lost Symbol by Dan Brown), but unless you have a researcher card you’re not allowed inside. It’s not difficult to get a researcher card but they discourage people from getting them just to check out the room because they are nice, plastic-printed, photo IDs. With that said, most people don’t get a chance to see this beautiful room except for a small overlook. Worst of all, photography isn’t even allowed from the overlook so you have no chance to capture the room’s amazing architecture. 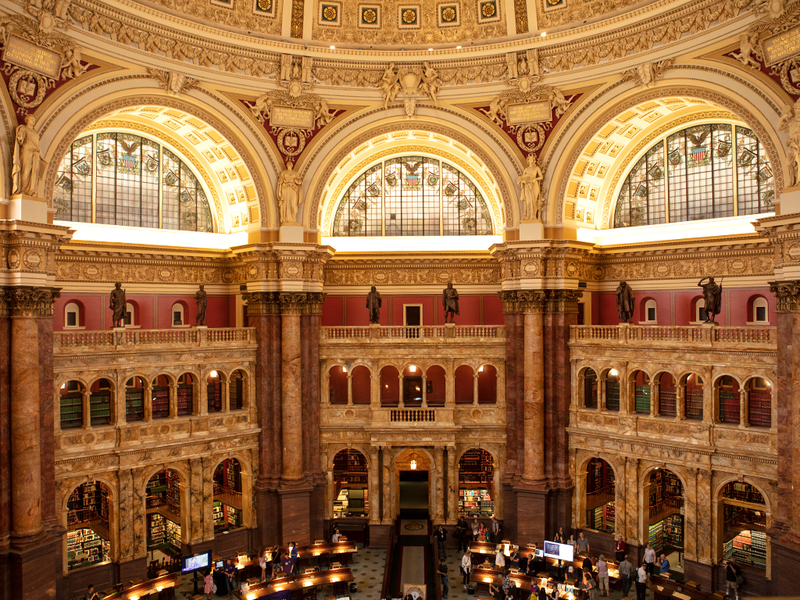 However, twice a year, on Presidents’ Day (in February) and Columbus Day (in October), the Library of Congress opens up the Reading Room to visitors and photographers. The Main Reading Room will be open to the public on the federal Presidents Day holiday, Monday, February 18, from 10 a.m. to 3 p.m. The Main Reading Room is located on the first floor of the Library’s Thomas Jefferson Building, 10 First St. S.E., Washington, D.C. American Sign Language interpreters will be available during the open house. Parking in Washington D.C is free on holidays.